You are here:Home Vocal Technique What exercises are best for warming up my students’ voices? A common question that teachers are often asked by their students is, “How should I warm up my voice before a show?” As teachers, our job is to advise students on how to get the best from their voices during a performance. The key to providing the best advice is knowing what a student needs vocally so we can prescribe the right tools for the job. The development level of the singer and the rate at which he/she can achieve vocal balance. The demands of the performance; sometimes the difficulty of the performance piece may require extra training or warm-up exercises. As a teacher, it’s important to understand that not all vocal exercises work for every student. There isn’t a one-size-fits-all approach to warming up a voice. Singers each have their own vocal tendencies that need to be addressed to enable them to perform at their best. For example, while a lip trill is an effective warm-up for many singers, it is not a good exercise for all voices—particularly for those singers who have trouble finding a strong chest voice. 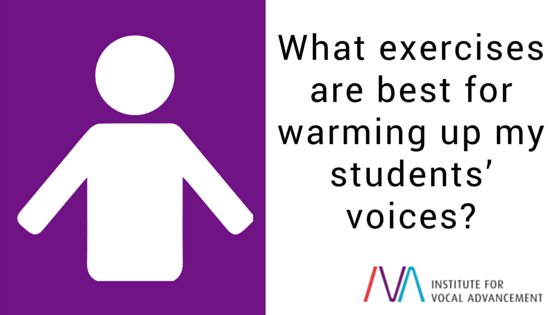 How long should students warm up? Herein lies the importance of finding two or three “home base” scales that bring a student’s voice into its best balance. By making a five- to ten-minute recording that the student can use as a warm-up, the teacher may instruct the student to concentrate on those two or three exercises that feel and sound great. This way, the student will better learn how to recognize chest voice, mixing, and head voice, and whether they are all working smoothly together. These exercises can also help the student determine their vocal stamina in preparation for a performance that may require long, sustained notes or demanding dynamics. Singers often tend to overdo it before a show. Remind your students how important it is not to overwork their instrument before they even start a performance! We need to help our students find the balance between warming up their voices appropriately to prepare for the demands of their performance versus tiring themselves out prematurely. Also, vocal exercises should be performed as close to getting onstage as possible—there is no point in warming up the voice and letting it cool down before the show. Help your students discover which warm-ups work best for their vocal needs. Every student is different, and every voice requires an individualized approach to determining the most effective exercises and warm-up times needed for a successful performance. To sum up, make sure you get to know the specific vocal needs of each of your students. Help them discover which “home base” exercises work best for them without tiring out their voices too quickly. Determine whether they can sustain long notes and maintain demanding dynamics as they prepare for a performance—and make sure they’re warming up as close to the actual performance as possible! Applying these tools and tips into your teaching will help your students achieve balance in their warm-up routines to maintain healthy, beautiful voices for many performances to come.